Q/ Would you please tell us about Carlotta Zambelli ? A/ I was never her personal student, but I learned everything rom her, because I admired her so much. She stood for the highest French and Italian tradition, that is, perfection, and work on the mechanism of movement. Mlle. Zambelli began to study at La Scala in Milan, she danced there, and then she was invited to Paris where she stayed the rest of her life. I spent such a lot of time watching Mlle. Zambelli teach ! She thought I was a pro-Lifar element, and she was rather against Lifar, because he had stirred tings up here in the Opera, turned things upside down. The first original work I was given to dance, was given my by Lifar, and that’s why she thought that about me. And also, the fact that I took lessons with some of the Russian professors. Then I fuond out that she had told a number of people "Mlle. Chauviré has understood everything, though I never taught her a single thing !" The truth is, that I watched her lessons, I "photocopied" everything, I made it my own. If eyes could eat, I could say I ate her lessons up with my eyes ! And then she said: Mlle. Chauviré is the one who upholds the tradition! " And when I heard that, how surprised and delighted I was ! Q/ When one reads about Olga Preobajenskaya’s classes in Paris, one wonders at what has gone missing over the past few years. A/ Over the last few years, the épaulements  have begun to disappear. People are aiming at "high-tech", they exploit jumps, or certain beats, or pirouettes, or those stretches that go on forever, but they have forgot that dance IS MADE UP OF DIRECTIONS AND EPAULEMENTS. I find that at the moment, people have difficulty making the head, the arms, and the torso, relate to what the legs are doing, how that all fits together, which means that the style has got more and more slipshod ! Personally, I also try to teach people what is épaulement, because I believe that that is what dancing is about, whereas, if one dances staring out at the audience, it’s utterly flat, the picture has no relief. Where there is no relief, there is neither rhythm, nor the proper accenting of a phrase. For example, in a jump, I see people going up like rockets, in one blow, BAM ! losing what should be the value of each successive moment, rising, and then ending when one touches the grounds. Instead, they’re suddenly up in the air, and it just stops right there, and the whole singing quality is lost. As for épaulement, when I’m at a loss about what to do to get the students to grasp that, I find myself pulling the curtains over the studio mirror, to stop the students staring straight at themselves, and then I shew them the steps with the épaulement again, and suddenly, the épaulement comes back ! Q/ In a recent interview to La Vie Scientifique, Mlle. Loudières attributes the rising tide of accidents to "technical progress". A/ It’s just what we were saying about the grand battement: nowadays, it’s simply flinging the leg, rather than holding it properly, and then bringing it down. Accidents are definitely not an "occupational hazard" ! I don’t believe that. The trend today is towards very extreme things, in all directions at once; such exaggeration may be good in a few cases, but the work is being done in rather too violent a way. I do agree with Mlle. Loudières. Take the case of Mr. Forsythe, the Frankfurt ballet master. I am impressed by how much he knows, and so on and so forth, but frankly, I wouldn’t have liked to dance his ballets one bit ! Fifteen minutes is enough for me ! He’s said everything he’s got to say in fifteen minutes, which is splendid, interesting, and so on - for fifteen minutes. His dancers are put through the wringer, it is extreme exercise calling for the use of great force. The mind of this man looks for extreme balances within an extreme imbalance. Well, such experiments are all good and fine, but the human body should not be exposed to that kind of risk. After all, it is a human body, not a thing like wood, that you can push to the utmost limit of its tolerance, and frankly, even with wood, I think one might shew a little sensitivity towards wood, too ! Opéra comique 1963. Collection particulière. Q/ Mr. Nadirov, director of the Vaganova Academy, recently told a British publication that he worried over his young students "wasting their time" on history and trigonometry, instead of taking more ballet lessons. A/ History, mythology, the literature of one’s own country, but also that of other countries, that is the very least we must know ! Geography, I love to study that, rather less Arithmetic, but just because I don’t like Arithmetic, doesn’t mean that one shouldn’t study it ! The Baccalaureate is fine, but even that is not enough. A dancer must have a much broader mind, and real depth of culture. People must use their spare time to improve their minds. Noverre may have been the first to say it, but he is not alone. Then you have people who are against culture. They may be educated people, but they don’t want to seem that way ! They go out on stage, and they want to do something ABSTRACT, which means that they want to shew especially nothing at all. They build some object, which is then carried from one side of the stage to the other, then they sit down, and let a full quarter of an hour go by, so the audience has time to twig into what he INTENDED to do ! I will not go to that sort of thing anymore. It is so divinely simple, that it is downright boring. You sleep right through it ! I have seen people sleeping all around me, and then I realised that I too was asleep ! Q/ Your Giselle is said to have been imponderable. A/ One rises towards it, over time. When I first began to dance "Giselle", I could not do it in that way. We all love this piece, the role, the choreography ! But even so, the role evolves through the years, through one’s career and one’s development as a woman. 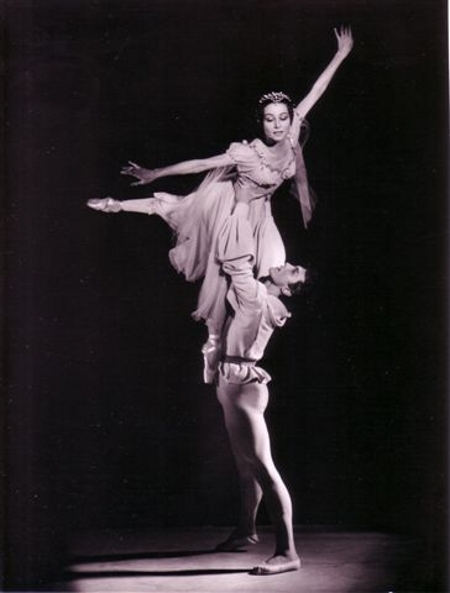 Every time I was put down on the cast list to dance "Giselle", I began to work alone, sometimes even without the music, and I tried to work deeply on the character, trying to find, in my way of moving, in my way of behavng, in my inspiration, that which was most like what the choreographer had wanted. And put away unnecessary things, to keep only the basic line, the most strict canvas of what should be said through the pantomime. And even technically, to be absolute. I looked into the technique very severely, very deeply, into the technique itself, to be able to go beyond it in a way, to make people forget the mechanism of the Romantic vocabulary, beautiful as that vocabulary is in itself. To be able to go beyond that, so that the mechanism can no longer be seen, so that, thanks to that mechanism, there remains nothing but spiritual elevation. And I do repeat, "thanks to that mechanism", because if the mechanism were not there, one can very well say, "I wish to be this, or that", but if one can hold no more than three seconds on pointe, one will never seem to soar, to be immaterial. It’s lovely to have a bee in one’s bonnet, and say "But I FEEL things". Fine ! But one must be able to DO it, technically. But that technique must never be visible. Great art, towards which I turned, I strove, and I do believe that at some moments, I reached, but if I could still dance, I would still be seeking along that path, I would still be trying over and again, to simplify, within the extreme difficulty. To simplify, within the greatest technical difficulty, to find the thread of truth, the silver thread that we must follow. Q/ What about the public today ? A/ As for the classics, I must say, that even audiences which have never seen a classical ballet before, when they do see one, they are transported ! You can’t do a thing about it, audiences prefer classical dancing ! How many times have we had a houseful of people who had never, ever been to a classical ballet, and what a triumph it was ! Whereas, if we listened to certain people, who cry "Enough of all that ! It’s old hat ! " - well, Old Hat it may be, but it still delights people, especially if it’s beautifully danced. Yes, it’s a delightful thing ! All this will never die ! Out of the ashes, the phoenix ! It will never die ! 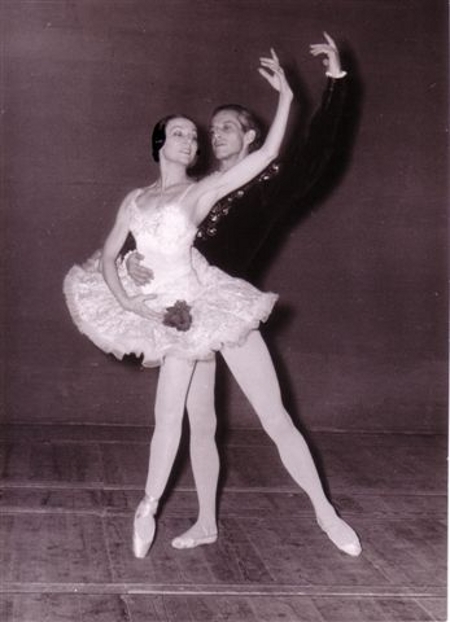 Here, in the Opéra, we are in the temple of classical dance, and with Mr. Nureyev, we are protected from the worst. What I still find a pity though, is that when it comes to new original works, there are none. There are new extreme things, extremely "modern", acrobatic display, and things, which to my mind, are not art. Doubtless, they are some kind of bodily expression, or whatever, and they can be very much in fashion, but you walk out of the theatre, and you have not really been transported, neither has your soul been deeply moved by it, it has nothing really to offer. They are simply shewing what goes on in everyday life, where people are so very bored, and where everything is so violent, so heavy, so "stressful" as they like to say now. And if, on top of all that, we must watch it on stage, we’ll never get out of it ! What a nightmare ! Obviously, one can always "go with the times", reflect the times, but since the times are not too cheerful ...Honestly, I wait until everyone I know tells me, "you must see this, it’s really good !" before I take the trouble to go out. Otherwise, I won’t take the trouble. Because it really pains me ! So much so, that I can’t sleep afterwards. I struggle inside right through the performance, and the worst part of it, is that nowadays there is often no interval, and one must hold out to the bitter end. Riveted to your seat ! Forced to stay, to look at things that one finds so unpleasant ! And one thinks! "Lord God ! Let there be a fire ! FIRE ! Let us out of here !" I am not in the slightest against new things, so long as they are beautiful, and good, and well done. I also don’t like this music that has got nothing to do with music, and all those odd noises they make ! It’s so boring, such useless gossiping ! Luckily, sometimes there is beautiful music, the choreographer has used music by Beethoven, or Schumann, or Mahler; then at least, one has ears, to hear with. One closes one’s eyes, and listens to the nice concert. A clever move by the choreographer ! Q/ What do you think about Bournonville ? A/ It’s wonderful ! Ten years ago, for the Centenary of his death, we all went up to Copenhagen, and we saw all of his works over a week’s time. It was wonderful ! We must keep that ! I was very excited also, over the way he does the pantomime. Here, we have only kept the worst aspects of the old pantomime. He has kept only the good aspects, everything is clear, readable, expressive. His vocabulary is very rich. The problem with most teachers at the moment, is that they do not really know the language, their knowledge is incomplete. That’s why they go round and round in a vicious circle, over and over the same set of enchaînements, there are no new combinations, and therefore they are really not fit to teach. To teach, one must have studied not only the vocabulary, but also the structures, the rules, the laws, all that which makes the beauty of classical teaching. 1. Mlle. Chauviré used épaulements in the plural, exactly as given here. Where she used it in the singular, we have left it in the singular.